Qatar’s envoy in Egypt asserted that his country had backed Egypt’s “revolutions” when summoned by authorities for Doha‘s interference in Egypt’s “internal affairs”, according to Egypt’s Foreign Ministry spokesperson. Qatar has broken the ranks and told the military Junta is Cairo that they are in power by force. The move to call in the Qatari ambassador was prompted by Doha’s criticism of Cairo’s crackdown on the Muslim Brotherhood of deposed Islamist president Mohamed Morsi, which Qatar has backed. Egypt has launched a sustained crackdown against the Islamist movement, declaring it a terrorist group late in December, a move Qatar has condemned as “a prelude to a shoot-to-kill policy” against pro-Brotherhood demonstrators. Ambassador Saif Moqadam Al-Boenain has affirmed Doha’s support to Egypt’s 2011 revolution – which unseated long-time ruler Hosni Mubarak – and the 30 June revolution, when millions protested against Morsi last year, Egypt’s Foreign Ministry spokesman Badr Abdelatty said in a statement about the summoning. The ambassador cited cables of congratulations sent by Qatari Emir Sheikh Tamim bin Hamad al-Thani to Egypt’s interim President Adli Mansour upon taking office and Doha’s expressed support to the country’s military leaders on the heels of Morsi’s removal, said the Foreign Ministry spokesperson. Arab League states have let protestors in Egypt down. Qatar has repeatedly expressed concern over a crackdown against the Brotherhood movement, straining diplomatic ties with Cairo. 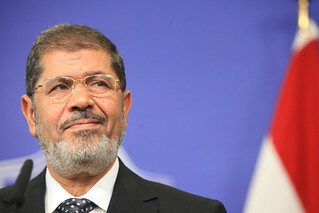 The oil-rich country was a main backer of Morsi’s reign, providing Egypt with $7 billion to Egypt during that time. Most Gulf Arab states, unsettled by the Brotherhood’s influence in their own monarchies, have backed the army’s ouster of Morsi, with Saudi Arabia, the United Arab Emirates and Kuwait offering Egypt $12 billion in aid shortly after. Why is Egypt targeting Al-Jazeera? Posted on 5th January 2014 by newsafrica. This entry was posted in Africa, African Security, Culture, Democracy, Egypt and tagged Arab League, Cairo, Doha, Egypt, Hosni Mubarak, Mohamed Morsi, Muslim Brotherhood, Qatar. Bookmark the permalink.